Wake Forest University awarded two educators $20,000 each for winning the 1998 Marcellus Waddill Excellence in Teaching Award. The winners, Katherine Zimmer of San Diego and Kevin Pittard of Covington Ga., attended the university’s Opening Convocation ceremony on Sept. 17 and were recognized as the award winners. The Waddill Awards annually recognize Wake Forest alumni who excel as educators. A primary and a secondary teacher are chosen for the award and are each presented $20,000. In 1994, New York businessman David Waddill established the awards in honor of his father, Marcellus Waddill, who retired in 1997 after teaching in Wake Forest’s mathematics and computer science department for 35 years. Nominees for the award must submit lesson plans, letters of recommendation and essays. In addition to being interviewed, all finalists provide a videotape recording of themselves teaching. Zimmer, a fourth-grade teacher at Carmel Creek School in San Diego, was selected as the award’s outstanding primary teacher. Pittard, a history teacher at Newton High School in Covington, Ga., a will receive $20,000 as the award’s outstanding secondary teacher. Zimmer began teaching at Carmel Creek in 1992. She graduated from Wake Forest in 1985 with a bachelor’s degree in elementary education. Zimmer then taught in Charlotte, N.C., while earning a master’s degree in intermediate education from the University of North Carolina at Charlotte. She has also taught in Japan, Virginia and the California cities of El Cajon and La Jolla. In 1994, Zimmer was named “Teacher of the Year” by the North San Diego County Consortium Honor Roll of Educators. Pittard graduated from Wake Forest in 1985 as a history major and then earned his master’s in education at the University of Georgia. He has taught history at Newton High School since 1988. 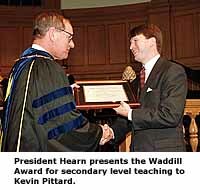 Pittard’s other honors include being named “Teacher of the Year” by Newton High School and the Newton County School System during the 1993-94 school year.